Review The push of SSDs into areas once considered the domain of the standard hard drive storage shows no appetite in slowing down, in fact the estimate is that the SSD market will grow by 30 percent this year (2014) alone. 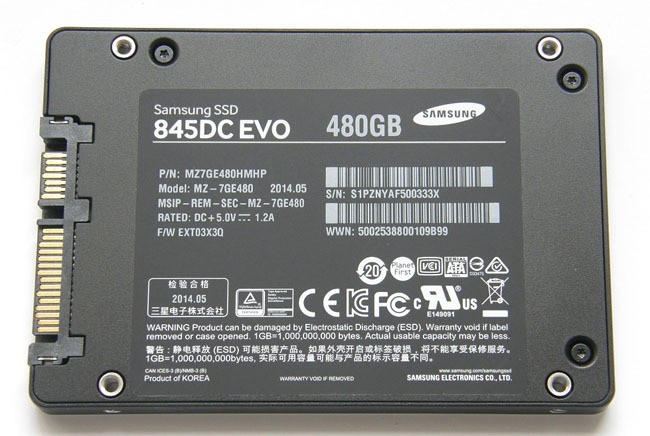 Many of these drives will end up in data centres and other enterprise storage areas, and Samsung has released a couple of new drive ranges targeted at these segments: the SSD845DC EVO and the brand new SSD 845DC PRO. In the past, Samsung drives aimed at this market segment have been pretty much OEM only but with the DC range it seems it has relented on this policy. The drives are available to SMB users and anyone else who fancies them. 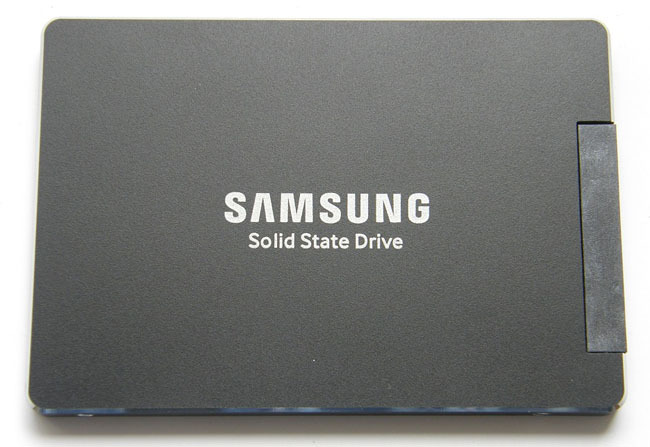 Although Samsung claims both SSDs offer best-in-class sustained performance, internally they are quite different beasts. 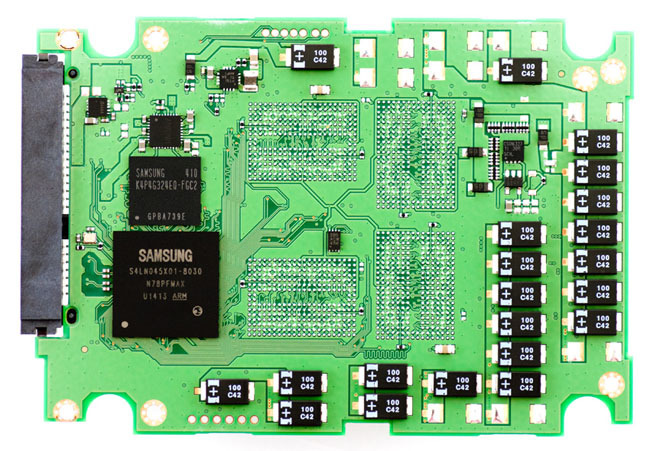 Aimed at read-centric applications such as content delivery networks and web servers the Samsung 845DC EVO uses 19nm 3-bit Toggle MLC (multi-level cell) NAND, the first drive in this segment to do so. Indeed, this is an interesting stance taken by Samsung over TLC (Triple Level Cell) NAND. When it was introduced in the SSD840, the general opinion (outside the company that is) was that TLC NAND was a dodgy road to go down given its higher latency and lower endurance than MLC. If you want to knock that assumption on the head, there’s no better way than sticking the NAND in a drive aimed at one of the most demanding of environments for storage drives – the data centre. Coming in 240GB, 480GB and 960GB capacities, the 240GB and 480GB drives have 512MB of LPDDR2 cache while the 960GB uses 1GB. 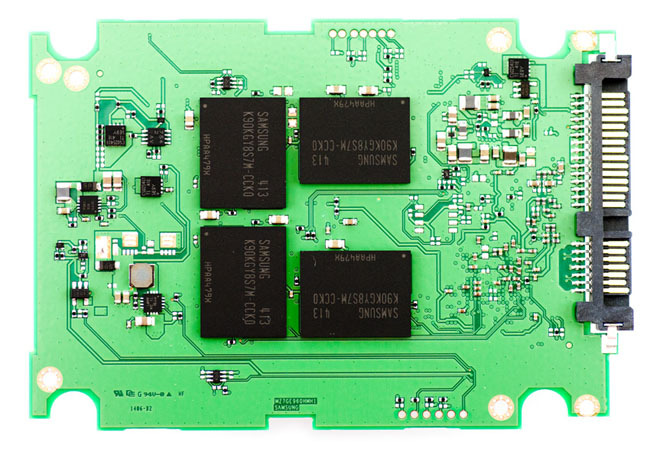 The 845DC EVO uses the Samsung MEX S4LN045X01-803, 400MHz, 8-channel MEX controller that first saw the light of day in the SSD850 EVO consumer drive. However, the firmware has been written with data centres in mind, providing end-to-end data protection and error correction through advanced signal processing with thermal protection support added into the mix. To get to its 480GB capacity, the drive uses just four 128GB NAND chips, each chip having eight 16GB dies. Sitting on one side of the PCB – along with the controller and cache chip – are twenty three tantalum capacitors in multiple rows, which allows the drive to write all the data in the cache to the NAND, in case of power failure. All three drives in the range have quoted sequential read performance of up to 530MB/s with both the 480GB and 960GB models having a write performance of up to 410MB/s while the 240GB drive lags behind writing at up to 270MB/s.